I don't know if you've noticed... But we're in the fourth quarter. Seriously. The fourth quarter, aka final quarter, of the year. Yep, October is coming to a close and the holiday season is upon us. Now this means a few things. And no, it's not that Pumpkin Spice is soon fading into peppermint and hot cocoa. It means that your time is more important than ever. Because the last 3 months of the year are absolutely the most important months of the year. These are the three months that help set the tone for your new year. Shocking, right? I'm already talking about 2017. But, friend, it's absolutely imperative that we have this conversation now. The fourth quarter is upon us. Meaning now is the time to make sure our goals are in progress and we're ready for the new year! Okay, so despite my insistence that this is important, I wasn't always an end of year hustler. Oh no. This time of year meant that I got to stop making orders and take time off to be with my family. I'm not even kidding. There was a period of time where I would take the entire month of December off work. Did I regret that time off? Absolutely not. Did I wish I had ended the year differently. Of course. Not because I'm an overachiever either. But because the work you done at the end of the year can make or break the beginning of the year. The year following my month long vacation started off with a bang. And not the cheerful happy banging of New Years celebrations. Instead it started off with me wondering what the heck was going on. It started off with me frantically trying to paperwork together and organized. It started off with me wondering if my audience still remembered me. Ah, to be a business baby again. Please... let me spare you the stress and agony of an unprepared year. 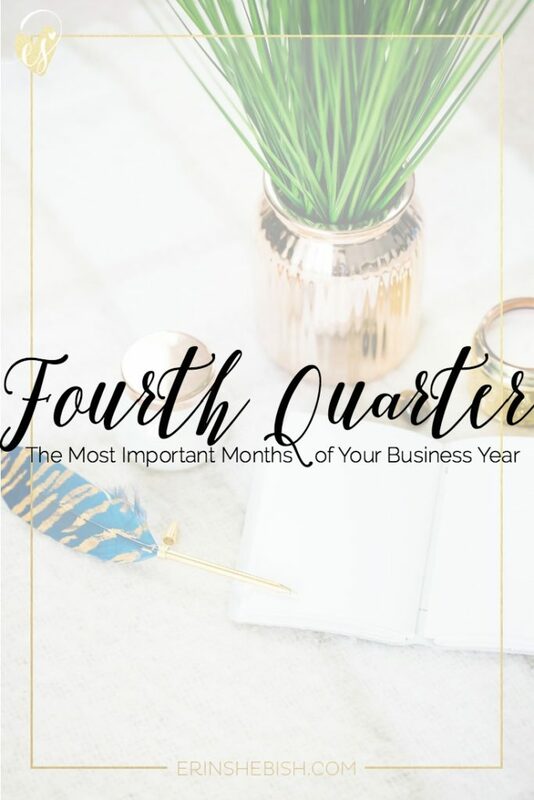 Let's just tackle our fourth quarter like the epic lady bosses we are. Hopefully you've been setting goals all year. Goals are like the mother of success. I won't bore you with those details because I know you've already set goals and know how valuable they are for your business. Anyway, it's time to do some goal review. Which goals are you still working on? Are your goals still in alignment with your primary objective as a business owner? Which goals are still important to you and your business? The point here is that it isn't too late to make a final push for goals that are actually worth while. Now if your goals are no longer in alignment with your business, you can assess why and eliminate it from your list. 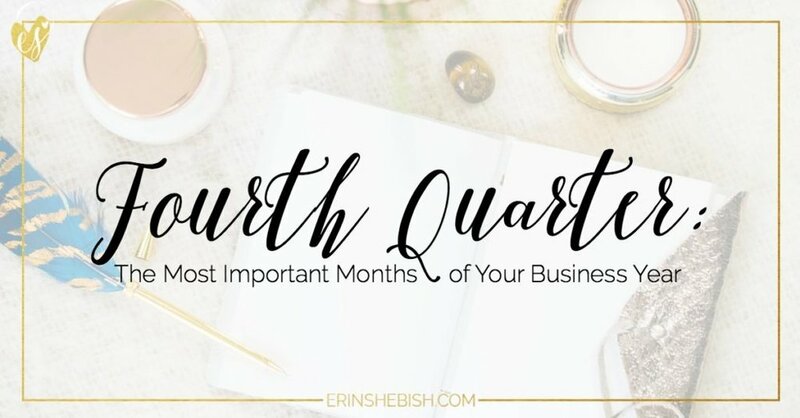 This will keep your mind clear and focused on the important goals for the last few months. So those goals that are still important? You can still make them happen. If not completely, you can put a major dent in them. For example, if you wanted to make a certain amount of sales or gain a certain number of followers... you can make that happen. And even if you don't hit the goal number, you've at least given it all you've got. Sit down with your year end goal and determine an action plan. Figure out what steps you can take to making that goal happen. Maybe it means advertising or sharing more with your business communities. Maybe it means finally hiring that designer for your site or making that beautiful brand session happen. Whatever your goal is, tackle it! I know. It's only October. But we've officially hit that time of year where we have to start thinking about the many holidays coming. How many family events will you be attending? What about community events? Are you going to want to take any time off? Sit down and take a peek at your calendar. Mark off the days that you know you'll be taking as a break and allow yourself some flex time for any festivities that may pop up. Once you've figured out what time off you need, you can schedule things in advance. Social media, out of office notices, even memos to your clients. If you're a business owner that sells a physical product, this is also an ideal time to determine what your shipping deadlines will be. You want to make your audience very aware of any purchasing deadlines you may have in order for them to receive gifts on time for holidays. Get those papers in order. If you're anything like me, your desk and files are probably showing that it's been a crazy year. Nows the time to start working on organizing your area. Mainly, your paper. Because unfortunately our favorite winter holiday precedes our least favorite winter event. Now I won't scare you with tax talk too much. Even my heart doesn't want to dwell on it too much. But truth be told, tax time is coming and the best way to tackle that properly is with everything organized and in order. You want your CPA to smile when you sit down with them, not freak out at the torn manila folder you've been stuffing receipts into. Even if you are your own CPA. And if you are your own CPA, here's a pro tip. Buy yourself a gift card to your favorite coffee shop now and slip it into your financial files for yourself. That way when you sit down in 2017 to do your taxes, it will come with a little pleasantry as well. But if you're a blogger, you don't have to go into all of this prep work blindly. Oh no. Because my dear friend Kirsten Thompson from SweetTeaLLC.com has you covered. Kirsten has taken her years of blogging experience and created a course that will not only help you finish this year on an awesome foot but start the new year off with a whole lot of awesome. Finish Big, Start Strong. This 7 week course is everything a blogger needs to get ready for a fabulous new year! #FinishBigStartStrong is an intensive 7-week course that will help bloggers & creative entrepreneurs evaluate and assess their existing content and marketing strategy, then develop a plan to make 2017 the most successful year yet. Don't spend another year working towards the same goals as previous years without ever accomplishing them. Learn how your editorial calendar, social media, and email marketing all fit together to help you meet your goals. Learn how to stay focused on your goals throughout the year so you can avoid distractions and opportunities that don't fit into your plan. Class starts Monday, October 31st. Get ready to #FinishBigStartStrong. And you can sign up by clicking here! Please tell me you're going to sign up... because this is magical. So tell me, friends, what are you doing to end your year smoothly? Be a Better Blogger: Blog Smarter, Not Harder.